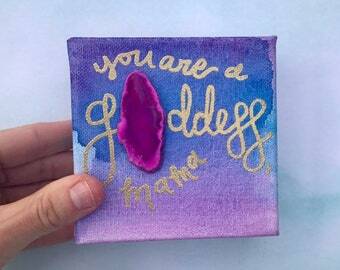 Handmade agate inspired artwork from my mama heart. Announcement Thank you for checking out Agate and Indigo formerly known as The Naptime Artist Studio! I create custom art from my heart. I am excited to announce that my studio is now running on clean solar energy!! I am constantly working on creating NEW items for my shop. Please check back soon for available items. Feel free to message me with custom requests and I can let you know my earliest window of availability. As of August 1, 2017 a portion of every Etsy sale is donated to the International Rescue Committee to if those whose lives have been affected if by disaster, famine, conflict, etc. Follow me on Facebook at Agate and Indigo and on instagram @agateandindigo for sneak peeks of what I am working on! Thank you for checking out Agate and Indigo formerly known as The Naptime Artist Studio! I create custom art from my heart. Lots of fun, new items in the shop! Go peek! New moon child pieces listed! Brand new listings! And my entire shop is 10% off! Thank you for checking out The Naptime Artist Studio! I am so glad you’re here! Please feel free to contact me with any questions and be sure to favorite any items you love!